If there is one thing I have learned from documentary making it is that the elements of a story can be combined in many ways. It is a puzzle in which the corners and shapes are fluid, at least on the surface of things. The question becomes how best to order and mix elements to tell a story. And this is the mark of the editor’s art. Recently I wrapped up a project for AnzaDays.com, funded by Arizona Humanities. I was hired to work with four Arizona Humanities scholars – poet Rita Magdaleno, historian Jim Turner, archaeologist Allen dart and author Gregory McNamee. Each had given a talk at Canoa Ranch on a particular subject. Before the lectures I talked with each about what they would be speaking about, and a bit about their own background, or the elements of their talk. I tried to find a location suitable for each person. 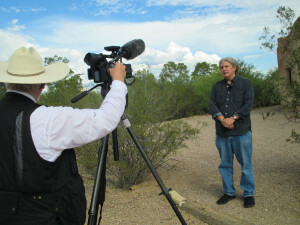 McNamee was interviewed at the San Pedro chapel in Tucson. Dart at a Hohokam petroglyph site near the Tucson Mountains. Turner was interviewed at Tumacacori Mission – a Spanish land grant location – and Magdaleno in Tubac along the Anza Trail and on the porch of the main gallery. These preliminary discussions were used to create 30-second web and PSA spots for the lecture series. I also filmed and shot still images of each lecture, as well as the gatherings at Canoa Ranch during which the presentations were made. Beyond the 30 second spots I was contracted to create five minute portraits of each to be used on their individual websites, as well as to promote the Arizona Humanities Council’s speakers program. In addition to the material I filmed I also had all of the PowerPoint materials of each speaker, and a storehouse of photos and stock footage from my own collection, all of which came in very handy in the story telling. With Allen Dart I had also taken a trip as part of his Old Pueblo Archaeology project to see vestiges of Hohokam culture in NW Tucson/Marana on the occasion of the Fall Equinox. While there I watched and photographed a dagger shaped shaft of light intersect the coils of a petroglyph spiral at noon on the day of the equinox. At the lecture event, I videotaped Spanish colonial era reenactors riding in and talking with the crowd. I also pulled up footage of the Presidio cannon firing from a previous Tucson birthday celebration, as well as shots of a Hohokam pit dwelling, and stills from a prior trip to Tumacacori. All of these elements came together in the words of the speakers and gave me options in story telling above and beyond the mere verbal expressions. In the end, as always is the case, it was trial and error that dictated the final sequencing and layering of words and images. But the synergy of those diverse elements told a richer story than any single member could. As always there were technical challenges. Matching audio and introducing visual elements of different aspect ratios, creating a sense of motion in still images through animation, and generally blurring the lines in transitions of elements required considerable focus. But in the end, all four pieces told good stories. And that’s what it’s all about.